Daytona Beach Shores. And although this post has nothing to do with the Regency time period I've written my last three novels in I find lighthouses and the sea fascinating and wanted to be certain to visit this lighthouse while I was in the area. I am a native born Floridian. I came into the world in 1955 in Coral Gables, Florida. Although my family spent only a short time there it is my birthplace, so when I visit Florida I like to learn as much as I can first hand about this state. The lighthouse experience was one of my favorite aspects of this vacation. The lighthouse is 175 feet high and it's Florida's tallest lighthouse. My family and I climbed every step of the steep spiral staircase. That's 203 steps! It was exhausting and exhilarating. I'm not one that enjoys heights but I have to admit that I loved the spectacular view at the top and the breeze. I think it hit 91 degrees that day. Our two daughters made the climb first and when they came back down said we'd regret it forever if we didn't go up and so we did. Both my husband and I were grateful for the landings along the way where we could take a breather.. It's not possible to pass others on the staircase because it's so narrow. If someone is coming down you wait on the landing until they pass. The lighthouse was erected in 1835 when the area was known as Mosquito Inlet. Don't you love it! I think I've got a novel brewing. :) Anyway, I digress. Although the lighthouse was built in 1835, storms and an Indian attack crumbled the building. It wasn't until 1887 that it became a functional lighthouse. Many thanks to Ellen for catching my error. I’m grateful that she did catch it. This is why when writing a novel you have to check and double check resources and information. You'll be thrilled to know that even though you may be far from Florida at this moment you can take a virtual tour HERE! Enjoy! There is a wonderful museum on the grounds that you'll see if you take the virtual tour. It was awesome! We bought our t-shirts and of course I had to pick up a book titled, Tales of Ponce Inlet by Ayres Davies. "In 1897, author and journalist Stephen Crane was en route to cover a brewing revolt against Spanish rule in Cuba, when the ship he was on, the SS Commodore, sank off the coast of Florida. Crane escaped in a small dinghy with several crewmen, and they eventually sighted and steered for the Mosquito Inlet Light. Crane used this experience in his short story "The Open Boat"." You can read more HERE! "Though accurate, the name Mosquito Inlet proved a deterrent to increased settlement in the area. To correct this problem, the name was officially changed to Ponce de Leon Inlet in honor of the famed explorer, and the lighthouse became the Ponce de Leon Inlet Lighthouse." More HERE! I'm giving away one copy of Mystery of the Heart today. Just leave a comment regarding lighthouses to get in on the drawing before midnight Pacific time. Open to USA residents only. I'll post the winner in the sidebar sometime on June 30th and get in touch if you leave your e-mail addy. Jillian Kent explores the darker side of Regency England. Her latest novel, Mystery of the Heart, released in January 2013. Her first novel, Secrets of the Heart will introduce you to asylum life, and Chameleon will take you into historic Bedlam itself. But never fear, romance is alive and well in all of Jillian's novels. Chameleon, recently finaled in the Selah Awards at Blue Ridge Mountains Christian Writers Conference and is now a finalist for the Daphne du Maurier Award through Romance Writers of Americas Mystery and Suspense Chapter. Hi Jillian! Lighthouse have always fascinated me too, from a very young age. After seeing Pete's Dragon, I saw just how and why they're so important! Now the ocean is just about my most favorite place in the world and I can never get enough of it. I'm an Air Force brat and we've moved and travled all over but the Atlantic I'd have to say is my favorite and the most beautiful. There's just so much history on the east coast. 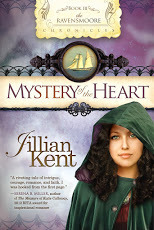 Thanks for the great post and theoppurtunity to win Mystery of the Heart! Sounds like you've seen a lot in your travels. There's just something about the ocean that is so mysterious, dangerous, and beautiful. Lighthouses are amazing when the danger draws near and so were the keepers of each lighthouse. Now it looks like you didn't say what your favorite was and I really want to know. :) You said, "I'd have to say is my favorite and the most beautiful." Don't leave us hanging. Oops! To answer your question is just a matter of left out punctuation. The Atlantic, I'd have to say,is my most favorite and beautiful! But for specifics just about any beach in New Hampshire (Portsmouth is where I used to live and dream of living in again) and Maine. I know they're very cold but I prefer to sit, watch, and listen! Hope that helps you not hang anymore!! As for the Ponce de Leon Inlet lighthouse, I can see how the area being called "Mosquito Inlet" would deter visitors! That is one time a name change was good! sorry, forgot to add my email! It's jimmynmatthewsmom [at] netzero [dot] com. Thanks! That's a romantic story. :) And yes, the name change was a good idea if they didn't want to scare folks away. I have visions of pulling out a can of OFF bug spray. It's not hard for me to leave a comment about lighthouses because they have always fascinated me, probably from the time I first heard the gospel song, "The Lighthouse," where Jesus is the lighthouse that rescues from sin. My daughter serves as a missionary in Germany and we don't get to see each other very often, but before she went, we took a mother/daughter trip to New England. One of the highlights was visiting the Cape Elizabeth and Portland Head lights in Maine - breathtaking to behold and many treasured memories from that trip. I'm eager to read your Regencies, Jillian, even if they do have a dark side. Thank you for the chance to win a copy. Thanks for sharing that story, Carole. That's a wonderful memory to share with your daughter. I'll have to look up the words to the gospel song. I don't ever remember hearing it but sometimes I have to see the words. My youngest daughter is currently a missionary with YWAM and at least for now she's in Texas. But she's been all over the world and she doesn't turn 21 till the end of July! Miss her face too. Texas is a long way from Ohio. :) My regencies have more of a Bronte feel than an Austen feel but I think you'll enjoy. Hope so! Get thee to a lighthouse! :) Definitely worth your time. Glad you're interested in the book! I love to explore lighthouses. I live in Michigan where we have MANY to visit! The view from the tops of them is usually magnificent. My favorite so far that I have been inside is Big Sable Point lighthouse in Ludington. A great walk along the dunes to get there, also. Thanks for a fun post! Thanks for the tip about Big Sable Point lighthouse. I'll have to Google it. I just love lighthouses. It would be just wonderful to see this one in person! The lighthouse that comes to mind right now is the Split Rock lighthouse on Lake Superior. It is such a wonderful place to visit! Don't you just love the names of some of these lighthouses?! Split Rock sounds interesting too. It's funny how I never thought much of lighthouses until this recent vacation. Of course I watched and read Dennis LeHane's novel, Shutter Island, and the lighthouse is a focal point, but a very difficult and depressing story. Not one I would recommend for anyone looking for an uplifting read, still it zeros in on just how horrible mental illness can be. And since I'm a mental health advocate I had to read it and watch it. I've been to lighthouses, but never inside. They are majestic when I look at them. 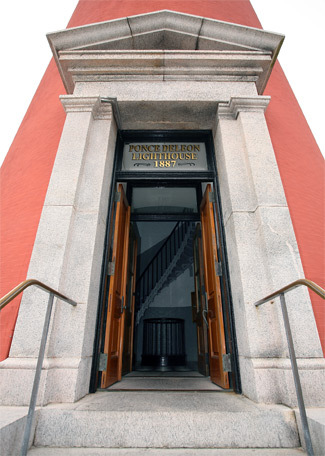 I enjoyed your post, virtual tour and history of The Lighthouse at Mosquito Inlet. Thank you for sharing. Please enter me in your giveaway. So glad you enjoyed the post. I thought it was really cool to be able to take the virtual tour especially after being there. I'll have to explore other lighthouses on line and see if they offer virtual tours as well. I think I'm beginning to see a real love of lighthouses from all the responders of today's post. Great fun! A light in a storm would be a welcome site to those on the sea. I can imagine the relief when sailors spotted them. I've never heard of a Lighthouse Passport Book for stamps. How cool! I have a feeling that I'm going to have to get one of those. :) Please share more about this if you get a chance. And I don't think I could handle open steps either. The climb at Ponce de Leon was intense but if I had to look at how far up I was through the climb I'm not sure I would attempt. Hello, I enjoy seeing lighthouses and reading about them but have never walked to top of one and doubt I could now that I am a senior. Love reading about them though and your pics are neat, thanks for sharing your love of them and the book which I would love to read. You might surprise yourself if you went slow. Ponce de Leon lighthouse had landings (not big) but enough to let others pass and take a breather. Glad you enjoyed the pics. I love lighthouses! And that book looks scrumptious. kkakins (at) gmail (dot) com. My daughter loves Light Houses and we have been to this one, I have pictures on my FB even. Unfortunately because of my knees I was not able to go to the top and she couldn't because of her fear of heights but her daughter (my granddaughter) did and we took pictures of her up there as she was taking pictures of us on the ground. We took pics of our two daughters at the top too. Lot's of fun. I never thought I'd get up there with my knees either, but surprises never cease. :) Glad your granddaughter made it. I bet she was proud of herself. Lighthouses fascinate me too. The hubby and I stayed at a lovely lighthouse in the upper Michigan peninsula last year. I've got some photos om my blog. Fancy meeting you here. :) I'll have to check those pictures out. How do you get to stay at a lighthouse? BETHANY! CONGRATULATIONS BETHANY. ( according to Random.Org.) I'LL E-MAIL YOU AND PUT YOUR NAME IN THE SIDEBAR. THANKS TO EVERYONE WHO SHARED IN MY LIGHTHOUSE FUN! Woo hoo! :D Thank you, Jillian!